What is HEAnet’s Schools Team? Since 2005, HEAnet have provided all of Ireland’s primary and post-primary schools (approx. 4,000 schools) with high-availability internet and network security services. 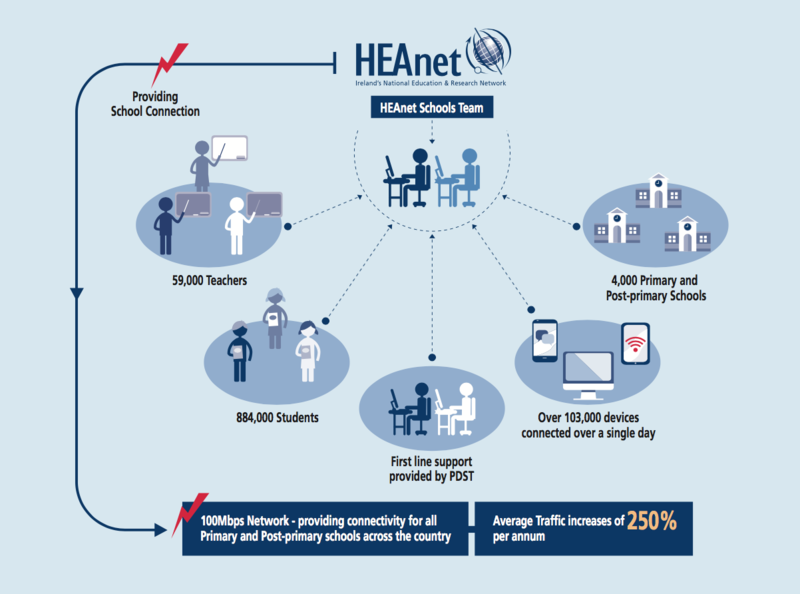 HEAnet provides the vital network connection to Ireland’s schools, which is then facilitated by private suppliers. The HEAnet Schools Team also provide escalation support for the PDST Technology in Education Broadband Service Desk (PDST) which looks after queries from the nation’s schools. The work of HEAnet’s Schools Team has allowed Ireland’s schools to enjoying unprecedented internet access and speed. Beginning in 2010, with a nationwide roll-out completed in 2014, HEAnet delivered a 100Mbps High Speed Schools Network for all of Ireland’s post-primary schools, special schools and hospital schools. HEAnet has achieved an average availability rate of 99.97% in these schools. This ensures Ireland’s post-primary schools are able to utilise the full range of educational and connective ICT services that such a robust connection provides. The importance of this high-speed broadband is illustrated by an annual 250% increase in traf c across the 100 Mbps network, with over 103,000 unique physical devices (desktop computers, laptops, tablets etc.) utilising the network every day. HEAnet also hosts identification for www.scoilnet.ie the Department of Education and Skills (DES) official portal for Irish education – ensuring teachers can easily sign up to this service using their Teaching Council Register details. These essential services make the HEAnet Schools Network one of the largest proactively managed networks in the country. HEAnet’s Schools Team actively monitors network performance, ensuring that service-level agreements (SLAs) are adhered to by suppliers. In cases where service is dropped or not delivered, HEAnet’s Schools Team accurately logs and documents this – delivering an impetus towards the best possible service delivery by suppliers and initiating savings from any SLA breaches. ICT has a key role to play in transforming teaching and learning, and the installation of high speed broadband in our second-level schools facilitates this. The 100Mbps Network is an excellent example of the Government maximising public investment by using HEAnet and the higher education institutions’ shared infrastructure. HEAnet provide a dedicated Schools Network Operations Centre (NOC) which delivers second level support to the Schools Broadband Service Desk. The Schools Broadband Service Desk operated by PDST Technology in Education (www.pdst.ie) provide first-line technical support for schools. For first-line technical support on your school broadband service please contact the Schools Broadband Service Desk by emailing broadbandservicedesk@pdst.ie or by calling 1800 33 44 66.